Montreal, March 31 2016 — The Research Institute of the McGill University Health Centre (RI-MUHC) will lead an innovative pan-Canadian network named CHILD-BRIGHT that aims to improve life outcomes for children with brain-based development disabilities and their families. 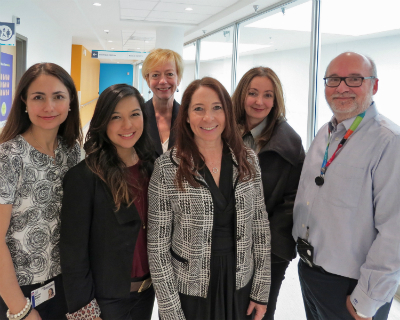 The newly created network is one of five nationwide projects that are being funded by the Canadian Institute of Health Research (CIHR) under their initiative Canada’s Strategy for Patient Oriented Research (SPOR). Each network received a $12.5M grant over five years from the CIHR that was equally matched by other funding partners. The announcement was made by the Minister of Health Jane Philpott at the University of McMaster, today. “We are very excited to launch this ambitious network which reflects our significant contributions and leadership in child health research across Canada,’’ says CHILD-BRIGHT Principal Investigator Dr. Annette Majnemer, occupational therapist and senior scientist from the Child Health and Human Development Program at the RI-MUHC, based at the Montreal Children’s Hospital of the MUHC and Vice-Dean of Education at the Faculty of Medicine at McGill University. “This total investment of $25M will allow us to work together and focus on the goal of achieving a brighter future for children with brain-based development disabilities and their families.” Dr. Majnemer is also the director of the School of Physical & Occupational Therapy at McGill University. Approximately 10 to 15 per cent of Canadian children suffer from brain-based developmental disabilities (BDD), which include autism, cerebral palsy, and learning disabilities. These are life-long chronic health conditions that result in significant challenges for both the child and family through every stage of development, from infancy to adulthood. The unique CHILD-BRIGHT network that will be co-directed by the BC Children's Hospital and The Hospital for Sick Children (SickKids) will include a patient-oriented research program, a citizen engagement program, and knowledge translation and training initiatives in order to develop new therapies and better services to promote the healthy development of children with these disabilities. “The CHILD-BRIGHT Network will bring together Children's Hospitals and their Foundations across Canada to embark on a transformational journey to improve the care of premature infants at risk, provide evidence-based interventions to improve outcomes and the quality of life in children with neurodevelopmental disabilities and work throughout the developmental years to help families navigate the care system at key points in their child's or youth's life trajectories,” says Dr. Dan Goldowitz, co-director of CHILD-BRIGHT, a scientist at BC Children's Hospital and a professor in the Department of Medical Genetics, University of British Columbia. Dr. Goldowitz is also the scientific director of NeuroDevNet. The research team plans to conduct a series of studies aimed at optimizing brain development, fostering social emotional well-being and the mental health of children and families, and delivering more responsive family-centered services throughout life. “A key ingredient to the success of CHILD-BRIGHT is the active engagement and participation of patients and families, healthcare providers, policymakers and health decision-makers, together with the researchers in all facets of our research program as well as sharing our knowledge and our findings to the right target audiences,” concludes Dr. Majnemer. This project was supported by the CIHR and main funding partners including the Montreal Children’s Hospital Foundation and Operation Enfant Soleil, BC Children’s Hospital’s Child and Family Research Institute, SickKids Foundation, IWK Health Centre and Foundation, with other funding partners from public and private sectors across Canada.